In modern society, Chemionix e-solutions Private Limited is one of the best CAD Outsourcing and Engineering Company that has established itself for a very long period. It helps in providing a great number of services including modeling and designing of villas, houses etc, it also provides CAD Drafting services and solutions in a most cost effective way. This process of providing the best solutions that are of the highest quality and giving them in very less time has made Chemionix as one of the premier CAD outsourcing company. The company basically focuses on the customer’s requirements and the design process is streamlined. The efficient technical’s help the customers to increase values in their business as a result your business will be more competent in the market. Out of the many services MEP modeling services is one of the outstanding services that the company provides which helps the customers to get the solutions and be benefited. The MEP model outsourcing services benefits a person in minimizing the cost of the project modeling, helps in having the same level of quality and also provides the facility of making standards. The services provided by Outsource MEP modeling are numerous. Some of the services are the selection of various kinds of Heating and cooling equipment- while selecting the various equipments one has take care of various aspects as to which one is better and which one is not, so for that Chemionix provides these design and drafting services of MEP that will help a person in choosing the right kind of instrument that will benefit a person’s work. The second service provided by MEP is that you can find out or calculate whether there has been heat loss or any heat gain that has happened during the process, for this the MEP uses a unique technique and helps us to know whether heat has been gained or lost and also gives the information as to how much joules of heat has been lost or gained. The third service is that it provides a schematic model of the cold and hot systems- As you have the design in your hand, you can now have a better look on all the components and aspects of both the systems that are responsible for heating and cooling, if any problem arises you will be able to locate it by studying the schematic diagram without going into the cooling and heating system as a result this prevents a lot of hazardous accidents that may happen if one goes to the system personally. 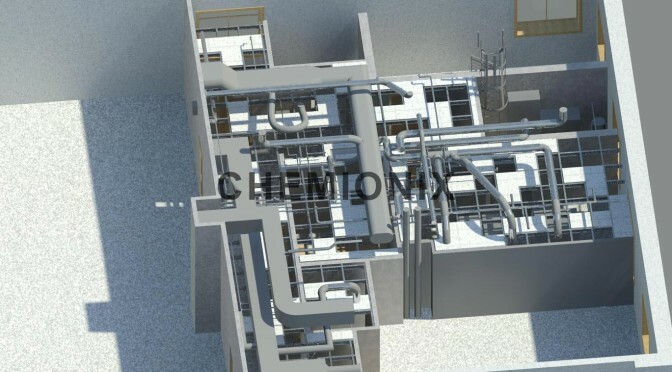 This MEP modeling and Design Outsourcing Company has helped us by providing a detailed model of the plant room. One can have the layout before the work process starts. This helps an Engineer to study the design minutely without leaving any kind of details and after that he can guide all the workers to do their work perfectly without any problems. The designs and diagrams supplied but the company is very much accurate ad we can get amazing output by using these. To know more about Mep Design Services please visit Chemionix.